It was only a fortnight ago and the Panthers enjoyed a historic 38-point victory over Adelaide Crows State League team that saw them end the minor round with a 10-0 record at Hickinbotham Oval - the first time the club has swept their home series since moving to Noarlunga in 1995. Buy your 2017 Membership before SANFL Grand Final day to get it at 2016 prices and go into the draw to win a Adelaide Oval Roof Climb experience at the SANFL Grand Final! The win also saw South Adelaide finish second on the ladder, which has proved vital to this weekend's clash, giving the Panthers a second chance in the finals and the opportunity to redeem their Qualifying Final loss to Sturt. As if taking on a strong Sturt side wasn't tough enough, the Panthers had to do so on the weekend a man down for much of the game. Emerging utility Tyson Brown injured his hamstring in the first five minutes of the Qualifying Final and will take no further part in South's finals campaign. So early in the contest was Brown's injury, he had not yet even registered a possession. Brown now joins a growing casualty ward in Noarlunga, which already consists of versatile tall Ben Haren (shoulder), vice-captain Tarak Redigolo (knee) and cult figure Jake Veide (knee). Meanwhile, Peter Rolfe (knee) has also yet to lace them up after injuring his ACL on the Queen's Birthday last season. Adelaide come into this week with several AFL-listed players potentially returning through the SANFL. Paul Seedsman (corked buttock) and Luke Lowden (ankle) were both late withdrawals from the side that demolished Central District by 72 points in their Elimination Final, but have been listed as tests this week. Similarly, Alex Keath (back) and Brodie Smith (concussion) are also listed as tests, however, the latter would need a clearance granted by the SANFL to be eligible to play. Adelaide's only long term injury concern is Sam Shaw, who has been placed on the long term injury list after struggling with concussion symptoms throughout the season. Crows veteran and former skipper Nathan Van Berlo retired from AFL action during the week, but has made clear his intention to play out the remainder of the SANFL season with the club's SANFL side. Keep an eye on the website on Thursday evening this week for the full Semi Final team. 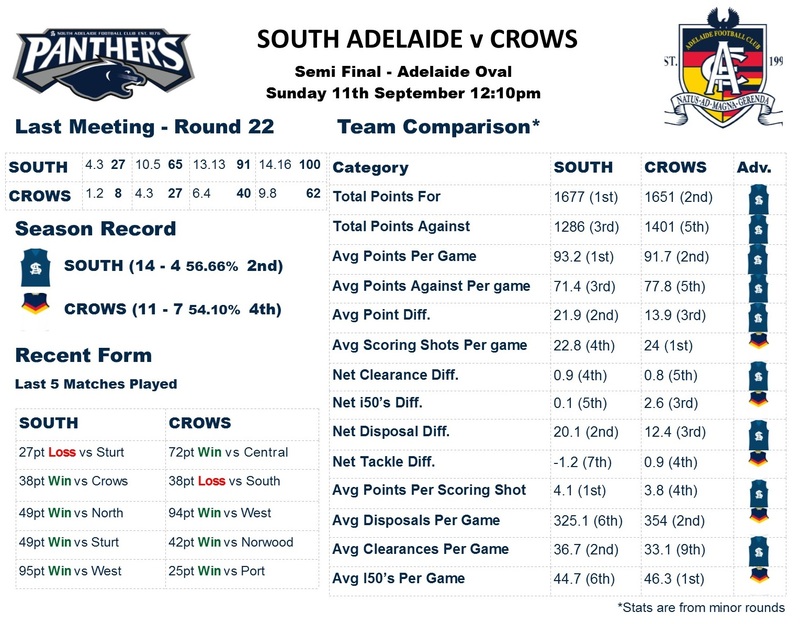 Semi Final Shootout: South Adelaide and the Crows are the two highest scoring teams in the SANFL this season. South Adelaide entered the Finals full of confidence and form, having won their last five games, including victories over fellow September participants Central District, Sturt and Adelaide. However, Sturt were able to stifle the Panthers trademark run and carry in their Qualifying Final clash, holding them to their second lowest score of the season and strangling them into a dour 27-point submission. In contrast, the Crows were seemingly floating across the surface at Adelaide Oval as they comprehensively eliminated Central District to the tune of 72 points. Boasting 18 AFL-listed players in their ranks, Adelaide were simply too strong for the Bulldogs, handling the blustery conditions better and showcasing their elite fitness and precise skills by foot and hand. 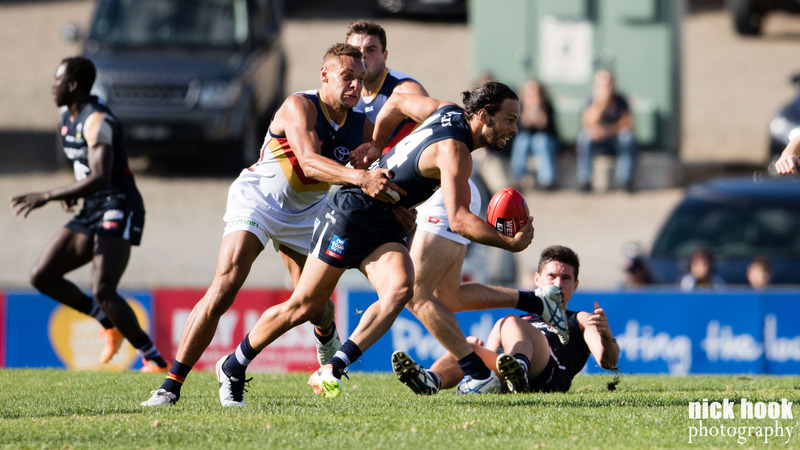 The Crows are one of the SANFL's elite ball-winning teams, averaging the second most disposals per game (354), which they quickly transition into scoreboard pressure - first in the competition in inside 50s per game (46.3), scoring shots per game (24) and second in total points scored in 2016 (1651) and points per game (91.7). The presence of Cam Ellis-Yolmen, Harrison Wigg and Mitch Grigg was evident in the clinches against the Bulldogs, while former Central forwards Wayne Milera and Troy Menzel, as well as West Adelaide premiership player Jono Beech and former basketballer Hugh Greenwood were game winners up forward. South Adelaide take a more traditional path to fuel their league-leading offence. They may not be in the top half of the league in possessions (325.1 - 6th) or inside 50s (44.7 - 6th) per game, but the Panthers midfield consists of several elite clearance winners that sees them ranked second out of the stoppages with 36.7 per game. Meanwhile, a league-leading accuracy in front of goal, led by Ken Farmer Medallist Brett Eddy, means the Panthers can put points on the board without requiring as many repeat forward 50 entries as their opponents. It should also not go unmentioned how strong South Adelaide's defence is. Both the defensive work of their midfield, who hold their opponents to an average of 20.1 less touches than them per game, and their backline, led by skipper Brad Crabb, who are ranked third in the league for total points and average points per game against, is as key as the firepower the Panthers have up forward. The Crows may boast a wealth of AFL-listed talent, but it is the Panthers that hold the bragging rights in 2016. South Adelaide defeated Adelaide's SANFL side in both Round Six and Round 22, while also claiming a victory during the preseason at Football Park. However, the Crows have been in rampaging form in recent weeks and their Elimination Final victory over Central District looked ominous. On Sunday the equation is simple; win or go home. It will be an enthralling contest between two sides that each play an exciting brand of footy. Make sure you get out to Adelaide Oval this Sunday to cheer the Panthers on from 12.10pm!